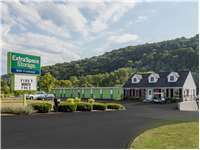 Located on Danbury Rd, Extra Space Storage serves residents of New Milford and Brookfield. Locals will recognize our facility a few minutes south of New Milford High School and Candlewood Valley Country Club near Faith Church. With a wide selection of storage units, climate-controlled storage, vehicle storage, and exceptional security, Extra Space Storage on Danbury Rd is your ideal storage partner in New Milford! Our New Milford storage facility can accommodate residential and commercial storage needs alike! We have unit sizes from 3x5 to 16x30 with features like indoor access, first-floor access, and drive-up access. At Extra Space Storage, your security matters. With security features like 24-hour video surveillance and electronic gate access at our facility, you can rest easy knowing your belongings are well-protected. If you need to store temperature-sensitive belongings, we highly recommend climate-controlled storage. These units protect your delicate items from extreme heat and cold by maintaining a temperature between 55 and 80°. Climate-controlled units are available in sizes 5x5 to 10x30. Looking for vehicle storage in New Milford? Extra Space Storage can handle cars, motorcycles, boats, and RVs with 10x10 to 10x30 enclosed drive-up units and 8x15 to 16x30 outdoor parking spaces. Extra Space Storage is dedicated to providing dependable self storage and excellent customer service. We maintain a clean, secure facility at all times, and we truly care about providing your with the best storage experience possible. Contact us today to reserve a storage unit in New Milford! I just rented a 5'x5' climate controlled space at the New Milford location. Recieved a follow-up call shortly after reserving a space online. The staff (mgr and asst mgrs) are very nice and attentive, and rates are very reasonable. Very satisfied. Wonderful customer service, friendly, courteous and professional. Great location, easy access, and competitive pricing. Move in was seamless and fast. Extra Space Storage is one of the best self storage facilities around. I'm a return customer. I had just looked at another storage facility in New Milford, and was not thrilled with the old, rusty, dirty units. Just on a whim I stopped in at Extra Space Storage... and SO glad I did. I am moving and needed a place for my things until we find a new house, and keeping everything clean was a huge concern of mine. The newer inside storage building with climate control is AMAZING! Looks brand new, not a spec of dirt anywhere! I cannot speak on the rest of the units (with outside access), however, just driving by they look 100x better than other places, the door seals are not ripped and dirty, they look to be in good condition. Definitely a place worth looking at! And I though I was going to have to find a storage unit (inside w climate control) all the way in Danbury, VERY happy I swung in to check this place out! Facility located in easy access. Registration clear and simple. Very satisfied with with storage unit and cleanliness. Clean facility, good location, friendly staff. I researched a few storage places online and I followed up with a phone call to each one. I chose Extra Space Storage for a few reasons: Price, Location and the employee that answered my call. He was extremely informative, very pleasant speaking and made me feel comfortable. Very clean and secure location with easy access and quick set up. Great place to store your things. Great location. Great Staff! Great Experience! The location is secure and the property well taken care of. Extra Space Storage was very easy to use and had great (and honest) customer service. The employees are very understanding and care about the business to make sure that you feel 110% comfortable leaving your possessions with them. Very open and honest about the polices and procedures- I've never seen such extensive care at a storage unit. Awesome!! The staff at my location are very friendly, helpful, and knowledgeable. The location is VERY clean!! I am very happy with my choice! I wad very indecisive about what size i might need, but the staff was very patient and took the time to explain pricing and show me the units. The grounds are secure and clean. There were other storage places closer to my location, but i have dealt with Extra Space Storage before and the customer service can't be beat! Reasonable price with very clean and secure facility. Easy to access and reserve as well as room to move in and around your storage unit. Nice ! I've always had a good experience renting storage at Extra Space. The manager is a great help and wants me to be happy as a customer. I've rented many times over the past few years and have always been treated well. Lots of smoke and mirrors. The offered price is not the real price. Unreasonable fees. They play dirty. The staff were excellent and very customer friendly. They were very helpful when I needed to move in. It was the best experience. We are extremely happy with this facility. It has very convenient hours, easy access in and out. The units make it extremely easy to store possessions. The on site managers are very customer friendly and helpful. There is 24/7 surveillance and they are extremely fair about payment. We researched facilities in the area and found this one to the most professional and we highly recommend it to the point that we went a little further in distance instead of choosing a closer facility. Very nice facility with great people, very clean and reasonably priced. Highly recommend! The customer service was great. I had to change my space to a bigger one and they did it with no problem. I would recommend this place to anyone who's looking for storage space. Very clean and well kept. Staff is very helpfull and courteus. From the North take Route 7 South towards New Milford/Brookfield. Continue driving and you will pass Walmart and New Milford High School on your right-side. Extra Space Storage is located on the right-hand side after Vision Engineering and is before Faith Church which is at the Brookfield town line. From the South Take Interstate 95 North to Exit 27A for CT-25/CT-8 towards Trumbull/Waterbury. Continue onto CT-25N/CT-8 North. Keep left at the fork to continue towards CT-25N and make a slight right onto Currituck Road. Turn right onto US-202 E/US-7. Take the “Super 7” towards New Milford. At end of the connector, go through the traffic light and stay in the left lane. You will see Faith Church on the left and Extra Space Storage is right after that. We are on the left hand side but you need drive pass us and make a U-turn about 500 feet after our facility. You will see the driving range on your right-side and Extra Space Storage will now be on your right-hand side after Vision Engineering, and is before Faith Church. Make a right-turn onto the property and stay to the left. Park your vehicle and walk towards the rental office which will be behind you after you park. From the East take Interstate 84 West to Exit 7, also known as “Super 7”. At end of the connector, go through the traffic light and stay in the left lane. You will see Faith Church on your left and Extra Space Storage is right after that. We are on the left hand side but you need drive pass us and make a U-turn about 500 feet after our facility. You will see the driving range on your right-side and Extra Space Storage will now be on your right-hand side after Vision Engineering and is before Faith Church. Make a right turn onto the property and stay to the left. Park your vehicle and walk towards the rental office which will be behind you after you park. From the West take 84 East to Exit 7 (left exit), also known as “Super 7”. At end of the connector, go through the traffic light and stay in left lane. You will see Faith Church on your left and Extra Space Storage is right after that. We are on the left hand side but you need drive pass us and make a U-turn about 500 feet beyond our facility. You will see the driving range on your right-side and Extra Space Storage will now be on your right-hand side after Vision Engineering and is before Faith Church. Make a right turn onto the property and stay to the left. Park your vehicle and walk towards the rental office which will be behind you after you park.